I tried my first fruit of my sanguinelli blood orange today. My young tree was really too small to be bearing fruit but I let it keep the two fruit it set this year anyway. The tree is planted at probably 650-700' elevation here just outside of Hilo, HI. Advice I had seen indicated that only Moro blood orange was worth growing here and that the others would not develop any color at all. I planted a Moro and a Sanguinelli with low expectations for either developing any real blood pigmentation due to our lack of any real cold snaps here. I was uncertain about the ripeness of the oranges. Regular oranges sometimes do not color up well here so I was not sure what to expect from a blood orange. The orange developed a nice deep orange color with a little rosy blush -- not the exterior color Sanguinelli is noted for but very nice! I was uncertain about the ripeness of the oranges; I would be gently probing & squeezing to see when they seem to have a little more "give". When I tried it today, it came off in my hand -- so maybe a bit over-ripe? 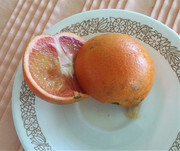 I was amazed when I cut the orange open, it had developed some nice rosy coloration in the flesh as well! The flavor was mild, low acid, mildly sweet, and juicy. It was sort of "citrusy" but not a typical orange flavor. There was another flavor -- maybe peach? -- that seemed more predominant. If I were blindfolded and someone popped this in my mouth, I would have no clue of what kind of fruit it was. My wife is not a fan of oranges but we both enjoyed it. I suspect it will improve significantly in the future. The fruit had 14 well developed seeds as well as 3 or 4 small aborted ones. Since I had no other citrus flowering at this time, I have decided to try to grow out the seeds. With no other citrus blooming, this will be a "selfing" (as plant breeders say) where it will just be juggling around the genes of Sanguinelli so there could be some interesting variants coming out of this. The bottom line is, if you are in HI or similar tropical areas, do not just dismiss Sanguinelli as unsuited for your orchard. It might not color up as well as in subtropical areas but you might still be pleasantly surprised. John, thank you for the detailed description of the fruit! I have been wanting one of these trees for a while and now feel confident about purchasing one. I have one that I hope will bloom and bear fruit this year. It is over 7 feet tall now. Both it and the Moro should bear this year. Kelley, I'm in Ga. zone 8a also, though south of you. TFN, I will keep my fingers crossed for you! I have a Tarocco that I acquired last spring, but topped it due to excessive pests. It is growing nicely, but it will probably be another year or two before it blooms. I look forward to hearing how the fruit tastes from GA! Lol. Have you ever tried pomelo? I think that is one of my favorite fruits. I have a Hirado Butan that is putting on bloom buds for the first time this year. It is the cold hardiest pomelo I know of. My pomelo tree has had a hard life. I planted it in a not-so-ideal spot, so I moved it. The dog did not like where I put it and chewed it off a few inches above the graft. Then I moved it again to a more protected spot last spring, now it looks like it is happy enough to bloom. Have you ever purchased trees from Brite Leaf? They usually have them in stock in the spring. I love dealing with Anna and Amber there. If you buy a grafted pomelo it should bear a few in a couple of years if it doesn't suffer from too much die back in the winter. I know what you mean about a greenhouse. I have over 50 citrus trees in the ground at the moment and a few more to plant when it warms up. I have a few getting ready to bloom and all the blooms are right next to the barrels of water where it stays warmer. I got my pomelo from Stan McKenzie. He lost most of his trees last year to the cold. Some he had had for close to thirty years, if I remember right. You GA guys will have to post some pics when yours bear, I'm sure they will put mine to shame with the pigmentation. It will be good to see pics of some getting a proper chill to kick off those pigments. Will be glad to, HIfarm. Did not mean to hijack your thread, sorry. I wonder how Cara Cara does in HI? I love a GOOD CaraCara. No worries. I think Cara Cara is supposed to do pretty well here. I am not a big orange guy, I tend to prefer mandarins but threw in a couple of blood oranges for variety.